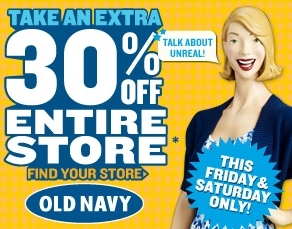 Word from the M80 Newsroom is Old Navy is the place to be tomorrow and Saturday (1/29 & 1/30). They are having a super sale with everything on sale for 30% off including clearance items. No coupon needed. Just bring yourself and your cash. Lucky for me, I’ve got cash in my clothing envelope so I’ll be heading there to snag some deals. Let us know if you scored anything great. LRWC Has Been Featured In An Article! !